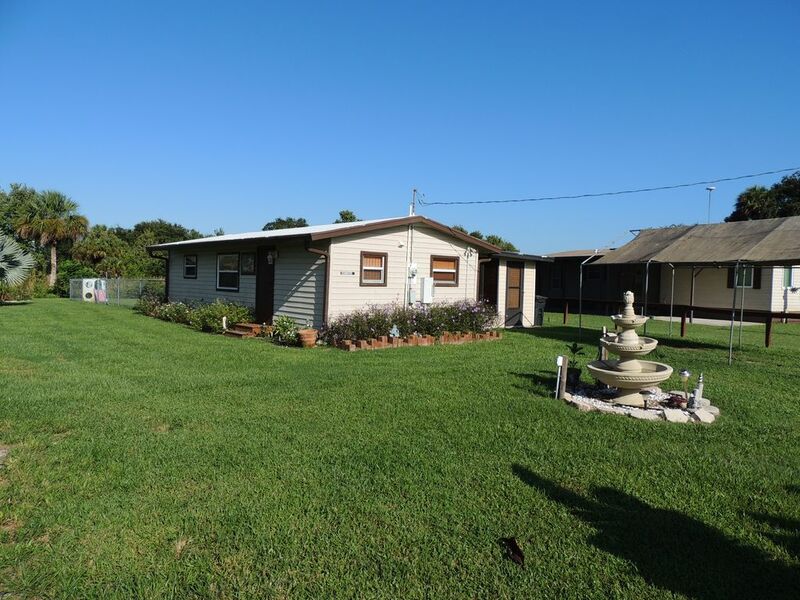 One Bedroom/ One bath Cottage located on the Kissimmee River. Sleeping in won't be a problem in your double pillow top queen bed, or when your relaxing watching your 42" flat screen TV in your over sized recliners in the large Florida room your sure to enjoy your stay at Grandmas Cottage. Like all our properties at River Bluff Fishing Resort it is equipped with everything you need, in the kitchen, it has plenty of linens and towels, all you need is your clothes and your fishing pole. Grandmas cottage sleeps up to six people, there is a Queen hid-a-bed in the Florida Room and a pillow top inflatable full size hide a bed sofa in the main living room for guests, second couple or the kids. Pets are also welcome at Grandmas cottage and they are sure to enjoy the large fenced in yard. You'll enjoy relaxing sunsets and the beautiful view of the River while being protected from the rain and bright Florida sun under your sun roof on your back patio or when grilling on your two burner propane barbeque grill. Grandmas cottage features a great view of the Kissimmee River. You have 7 large windows over looking the River. or enjoy your 42" flat screen TV while relaxing in the evenings. If you enjoy grilling out side you'll love Grandmas cottage.covered back deck. featuring a two burner propane grill with four seat patio table. .
River Bluff Fishing Resort in Okeechobee, FL. Which is located on the Kissimmee River just minutes from Lake Okeechobee by water or by land. Grandmas cottage is located on the Kissimmee River. two sets of sheets for each sleep area. nicely equipped kitchen with everything you need.electric stove,built in microwave,frig w/ ice maker,crock pblender,mixer,toaster,coffee pot and all cooking utensils Pots,pans,dishes you'll need. Seminole Indian Casino with in 15 minutes,less than a mile to store & bait shop, Fresh water fishing, 15 to 20 minutes to lock and Lake Okeechobee access by boat, Air Boating, Fish off the shore in your back yard, 10 minutes to dining and retail stores, Bowling, Movie theater. Rodeo, Arts & Craft Festival in March. 45 minutes to Sebring Mall and about an hour to Florida East Coast activities Less than two hours to Florida West Coast activities and Orlando attractions. Local entertainment and dining with in 7 miles.